The layers of this overlapping, geometric contemporary Downtown area rugs will provide a unique visual interest to your room. The hand carved technique used will add texture and detail to each design. The colors were vibrant and beautiful. True to online colors. Good quality rug. It matched my decor perfectly. I was pleasantly surprised and received lots of compliments. This rug changed the whole look of my living room. Would recommend. Love the deep rich colors! Lots of compliments! We ordered a total of 4! One large area rug, the 5 X 7 for my computer area and the runners for the back door area and in front of the loveseat! Good quality & pricing! We love the vibrant colors. Good quality for a good price. We are using it in our office, and it is a great size for the room. Got a rug pad to go under it as well. I love this rug! The colors are true to the pictures. It coordinates perfectly with the Alise Lagoon Black Transitional rug that I had purchased previously from Overstock. The materials are great for our beach condo. I love the colors in this rug. They are true to the colors in the photo and match my decor perfectly. It has held up well through my grandsons play time and spills and the subsequent cleanings. The colors in this rug work perfectly in my living room; it is the same as it looks in the photo. The durability seems to be great as well-it is not falling apart after vacuuming, which is nice, and doesn't show signs of wear (it is located right in front of our couch). Very satisfied with this purchase. This is a great rug, the whole family enjoys it in our living room. It came promptly and in good condition. The colors are true to the picture. This rug was of high quality. The description was accurate. It matched my room decor well. I was surprised it was larger than I expected which worked put great for the space. "I have ordered the 5"2 by 7"2 rug for my dinning room table. The table round glass and is 48 inches with 4 chairs. Will this rung be large enough for this round table or will it be too short?" "Is the red a bright red, barn red, or more maroon?" It is like a maroon color. 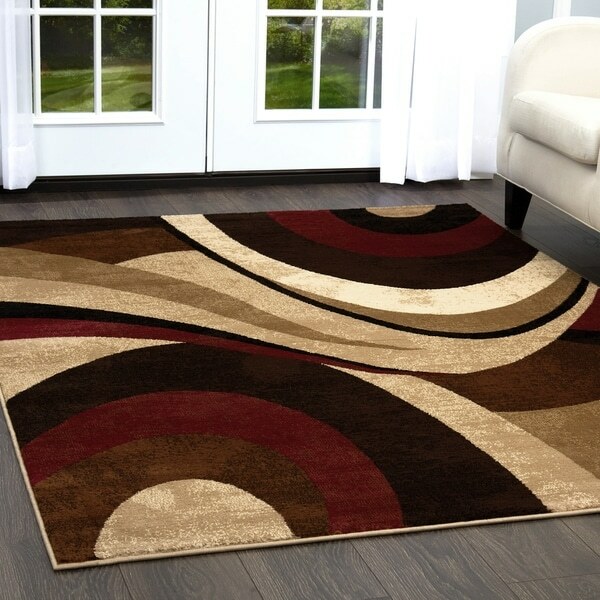 The colors is this rug are beautiful and the quality of the rug is very good. I just love this rug. Because I like the colors and design. I'm just hoping it stands up ... I had a similar one but the burgundy swatch was defective, those areas become thread bare but all the other color areas were fine. I just purchased a home and need a rug to go under my dining room table since there is carpet in the dining room instead of hardwood floors. The colors in the rug are exactly what I have been looking for and I think this will look great under my table. Hoping it will be big enough. Carolina Weavers Riveting Shag Collection Circular Flare Brown Shag Area Rug - 5'3" x 7'6"